There is a story circulating on social media (facebook, google+, etc. ), about a dog named Jake, who was poisoned at a dog park via a discarded toy (nerf football). According to hoax-slayer.com, this specific story cannot be verified and it is more than likely, like the spam emails we still see from time-to-time, a fictional account. With that said, there are verified incidents (reported to authorities and in the newspaper), one in San Francisco in July 2013 (poisoned meatballs in several dog parks) and in Portland in January 2013 (anti-freeze-laden water in a bowl hidden out of sight of human eyes). Central Ohio is the home of one of the most popular dog beaches in the country (Alum Creek Dog Park) and dog parks abound! 1. Make sure your dog's vaccinations are up-to-date. Try to know the dogs your dog is playing with, ask their owners if their dogs' vaccinations are current. 2. You know your dog, now know the park - consider visiting the park before you bring your dog - check out the rules, the dogs, the culture, the people, and the play activity. When you decide to bring your dog to the dog park, look everything over before your dog bounds out of the car for big fun. Know the posted rules by heart. Do a park sweep before your dog even gets out of the car. Seriously look for red flag issues, like discarded food, bowls of water, toys, broken glass, nails, and presence of aggressive dogs. How does play area access work? Are dogs able to run from the play area if a gate opens? Dogs might also rush the gate to greet a new playmate. Think like a dog when you are running recon - look at the park from a dog's eye view (predator humans will place bad things where your dog will find them, but you won't). Assess the other dogs already at play in the park. While your dog is playing, assess any dogs on their way to the playing field. Let your dog get used to the play area before you release them. Are big dogs and small dogs separated (they should be, even if it's to keep little dogs from being unintentionally trampled on in a moment of play with wild abandon)? 3. Bring your mobile phone and make sure it's fully-charged. 4. Just like a child - your dog(s) should never be out of your line of sight. Your dog should only play with toys you've supplied, and never eat anything he or she finds at the park, like poo (oy!) or discarded food. Your dog will want to keep playing and playing - know your dog's body language - know when it's time to take a break. 5. Make sure your dog has a balanced energy level. 6. There is a difference between the romance of a dog park and the reality of a dog park. Good canine and human citizenship is a must. Your dog is just going to be a dog. (Always a dog first.) So, this experience isn't ever about you (don't be embarrassed if your dog doesn't join in, or behave in a way you expect). Know the difference between a dog-at-play and an aggressive dog. Don't hesitate - if you recognize an aggressive dog, turn around and leave and don't enter the park at all, or carefully, calmly retrieve your dog from the play area. You can always go for a ride in the car, play at home, and go for a long walk that day. If you have one inkling of concern - pay attention to it, trust it, don't dismiss it. If your dog is not willing to share toys - that could cause some stress in the play area. If your dog is not socialized, timid, used to being around other dogs or fearful - acknowledge it, accept it - dog parks are not for all dogs. 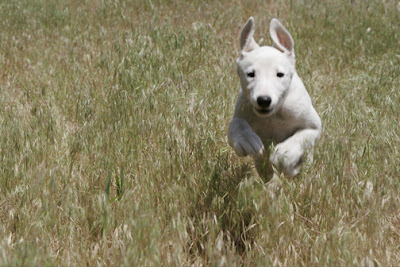 An insecure dog can become a target of other more dominant dogs and will find the experience stressful and in no way fun. If you own an aggressive dog - that's probably something you already absolutely know at this moment - acknowledge it, accept it - skip the dog park for now. Until a timid or aggressive dog is appropriately socialized and balanced, find other outlets for exercise, interaction, and play (like go for a ride in the car, play at home, or go for a long walk.). Pack the poo bags, too - gotta pick up after! Be prepared to know how to recognize an actual dog fight (as opposed to barking or posturing) and how to safely break up a dog fight. 7. Sit. Stay. Leave It. Come. No. Your dog should minimally be responsive to these calm assertive commands and be well-trained, balanced, and fully socialized (there is a dog culture and there are rules for play). Entry and exit, should be low key, paced, and calm. 8. Hydrate. But, hydrate safely. Don't let your dog drink from bowls of standing water. Bottled water you brought, running water or a dog water fountain are preferable. There are even water bottles that come with their own fold down bowls for easy lapping! 9. Manage expectations. When it's hot and humid out and the sun's beating down (and check the "feels like" temperatures) it may not be a day for the park. Know your dog's hot weather body language and understand how dogs cool-off - click here for more information. 10. Make the trip to the dog park grown-ups-only. Dog parks aren't really kid-friendly areas and you don't want the activity or safety of a child to be a distraction from the safety of your dog and vice versa. Burn energy and engage the brain! Along with dog parks, look into enrichment activities like agility training and competition, triebball, regular visits to dog-friendly walk/hike trails, and local dog frisbee clubs.